Why Are Logo Design Contests So Popular Today? Logo Design Contests are quite popular in today’s world and most of us have heard about it from some place or the other. It is a concept that is fairly known to people around because of its rising demand. If you are not aware of the concept, let me map out what the contest stands for and what it entails. Let us start from scratch and explore this innovative idea. There are specialised websites that deal with the creation and management of logo contests. These sites are popular among people who are either looking for a brand new logo or who need a redesigning of their current logo, so that their brand value is maintained. Outdated logos or missing logos can negatively impact a business because face value is all important in this era. What exactly are you looking for? Do you want a brand new logo or a re-design of the current one? How much are you willing to pay for the job? The next step is to select the site that would host your contest and help you in earning a logo. After the website is chosen, the price that you are willing to pay is selected. Finally, you enter details of the kind of logo you would want. Post the completion of these difficult tasks, you can sit back and relax, while letting logo designers do their deed as per your requirements. The model of logo designing is rather simplistic in nature. This is one of the primary reasons that logo design contests are increasingly becoming popular with the current generation. After considering the pros of logo designing contests, let us take a look at the not-so-pleasant aspects of this procedure. Logo design contests are not always very beneficial or productive for the person or the website hosting them. Why? Because getting your logo designed in an open contest can have dual effects. If you can afford it, going through the old-fashioned route (one-to-one assessment with one selected logo artist), should be an excellent opportunity for you. Unfortunately, tastes differ from person to person, so you might not share the same liking as the selected logo designer. I learnt this the hard way. I was in need of a new logo and directly approached a few artists, with impressive portfolios, with a logo design request. They readily agreed to work with me and immediately started working on their designs. After they were done with their work, I was left feeling disappointed and disillusioned because of what they presented in front of me. The logos they had come up with did not impress me in any way. I kept wondering what could possibly go wrong because their previous projects with other companies had been hugely successful. It was then that I realised the difference in individual taste. I also came to accept the fact that a logo designer is a human who is subject to errors and some concepts or niches may not be his/her forte. No matter how credible he/she might be in the field of logo designing, he/she could very well fail to deliver his best for the next project. So how do we conclude this debate of whether logo design contest is worth the hassle or not? Like creating a piece of art, logo designing is also exclusive to each designer. Every artist has their own forte; some have mastered landscapes, while others do well in portraits. Similarly, there are different sets of people in the logo designing industry. They have different mindsets. Their tastes and preferences also vary from one to another. It is an easier job to choose a winner if the designs come from different people. The attempt to pick a design from the works of a host of designers could be an added advantage. This can be easily achieved with the help of a contest where tons of designs are uploaded without being harsh on your purse strings. While you may end up with more than what you can handle, you are also sure to receive a great amount of overused and recycled logos from money chasers instead of high quality logo designers. Not all designs are unique and worth the price. Why do you get truckloads of overused logos in a contest? Well, the answer is simple. High quality logo designers do not participate in logo contests. Their schedules are packed and it is simply not worth their time to compete for the same price as other substandard designers are participating for. Genuine designers consider their work as pieces of art and unparalleled in their value. Each one looks at their work and concepts as the best in the industry. It is extremely upsetting for them if, after investing their precious time and energy in a contest, their work is not appreciated enough to be winners. This is one of the prime reasons why they refuse to compete in such contests. One of the final reasons that speak in favour of logo design contests is the fact that it saves a lot of time and is definitely more convenient. Professional logo designing takes way more time, with preliminary stages including extensive research and questionnaires in some cases. As a result, creation of your logo might take several weeks. It normally takes significantly fewer days to see your final logo in a logo design contest. 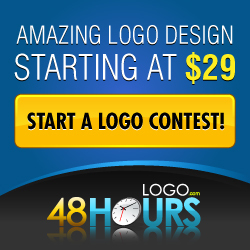 Hence, if you are looking at quicker avenues, running a logo designing contest will be your best bet.